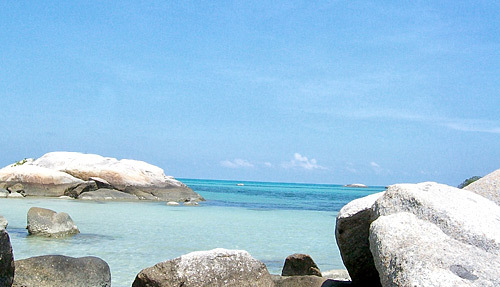 East Belitung conceals many beautiful tourist charms. If you love nature tourism, Punai Beach is an excellent option. This stunning beach is located in Tanjung Kelumpang Village, Simpang Pesak District. The beach features tons of beauty. You can enjoy many features like clear sky water, blue sky, granites, and soft sand. The beach is named after a rare species of bird in Bangka Belitung Province. Punai is actually a type of pigeon. According to the legend, there was a magical man. He was able to kill Punai only using his finger. He aimed and shot the bird without weapons. When it comes to the beauty, Punai Beach is indeed stunning. The view of the coast is mesmerizing. The sand is white and the water is calm. Near to the beach, you can find several coconut trees. There are also pine trees. These make a shady and comfortable atmosphere. As mentioned earlier, the water is crystal clear. Almost all visitors want to play or swim in it. Next, the shorelines feature numerous granites. They come in different size and shape. The best time to visit Punai Beach is during the low tide. At that time, you can conduct beach walking comfortably. In the back, there are coconut trees. Sitting under those shady trees are indeed relaxing. On top of that, the views are great! Thanks to the local government, tourists are able to enjoy many types of facilities like a cottage, local food stands, toilets, etc. No wonder, visitors won’t complain at all. The atmosphere is peaceful and comforting. Punai Beach is suitable for relaxation. Thanks to the blue color of the sea. It creates a soothing nuance. During weekends, more people visit the beach. Due to this fact, you should come in busy days for a more peaceful ambiance. The next attraction is the fishermen’s activity. Just like in Tanjung Binga Beach, you can see some fishermen in the morning. These local people return to the land from their daily routine. It is possible to buy fresh fishes from them. Another attraction is the sunset. You can enjoy a romantic and beautiful sunset in the afternoon. It is the last thing to do in Punai Beach. Make sure you come here in the morning, so you can explore the beach thoroughly. If you want to stay for several days, you can rent a room in a cottage. The fee is affordable and it comes with many amenities. One thing, you should have prepared everything. These include clothes, a camera, a sunblock, a hat, etc. Punai Beach is situated in the southeast part of Belitung Island. It is about 93 km from Tanjung Pandan. If you come from Dendang District, it takes only 18 km. For those who come from Hanandjoeddin Airport, it takes much longer. The trip usually takes about 2 hours. It depends on your vehicle. Your destination is Simpang Pesak District. From here, you can head to Tanjung Kelumpang Village.